I'm a third generation Frank, and the first of my line to not start a business with a storefront. Though he works in consulting now, my father owned an appliance store for 20 years in my hometown of Eastpointe, opening it when it was still called East Detroit, and rebuilding it from the ground up when the building burnt down following a lightning strike. Nowadays it is owned by a Physical Therapy company, but the building still stands, albeit redone in their style. I delivered appliances out of the back room of this storefront from the time I was 13 until I was in college. My father is Jr. and I'm Frank III, but Frank Sr. has owned a variety of businesses in the City of Detroit. Among his first forays into business was dry cleaning. Here, on the east side at Hayes and Saratoga, stands the actual plant where cleaning was taken from a variety of drop-off centers throughout the Detroit area. My grandfather is 82 and decided to retire about six months ago -- to get him to that point, he had to become extremely ill. I know that he isn't missing the drive, but he loved the people. That's why he kept going at the Video Store, together with my grandmother, for as long as they could manage it. I spent a few summers working with him there while his wife underwent knee replacement surgery, and watched him interact with his remaining customers, knowing them all by name. I know it doesn't seem feasible that a couple in their late seventies would continue to work at an independent video store at Gratiot and Outer Drive, but they did until they couldn't. The storefront you see here is actually a set of buildings, one of which was my father's first appliance store, and all of which once belonged to my Great-Grandfather Milo. Yes, he didn't have Frank for a name, but he started it all, and I can appreciate that. Milo dabbled in a lot of businesses in Detroit, being the first generation born out of Italy, but I recently found out about his first business of his own -- at the corner of Mack and Dubois, which I used to pass everyday on my way home. It doesn't look like much, but this service station was once owned and operated by my Great Grandfather. You can miss it easily, but thanks to looking into everything I can learn about the family history inside the city limits, I'll never miss it again. As a matter of fact, I will go out of my way to pass by. I'm a schoolteacher, and I don't have much ambition to own a business or keep up a storefront. These buildings, though, are a part of my family history, and I will always remember them as being a part of me, and the reason that the generations led to me. Recently, I tried out a few more methods for transferring my photography onto new ways of displaying it. Here's what's new. These two I hand-transferred onto canvas using the same process I described before for transferring onto wood -- gel medium and a laser-printed photo (reverse printed), then the removal of the paper (but not the image) by wetting the paper and working/peeling it off. 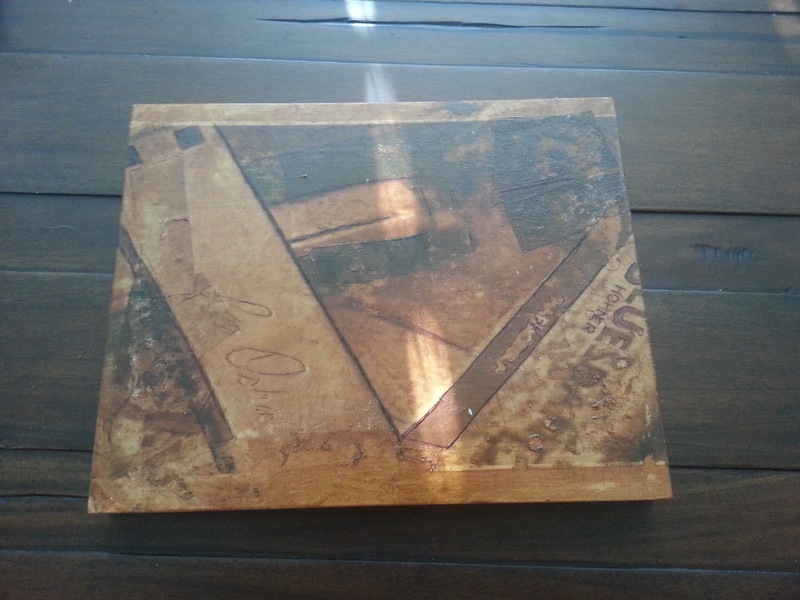 For this transfer, I sepia-toned and reverse printed onto t-shirt transfer paper, then ironed it onto wood. After the transfer was complete but before sealing it, I stained the image and wood itself, and also highlighted a few of the lines/shadows with an extra-fine point Sharpie. It wasn't my best work. 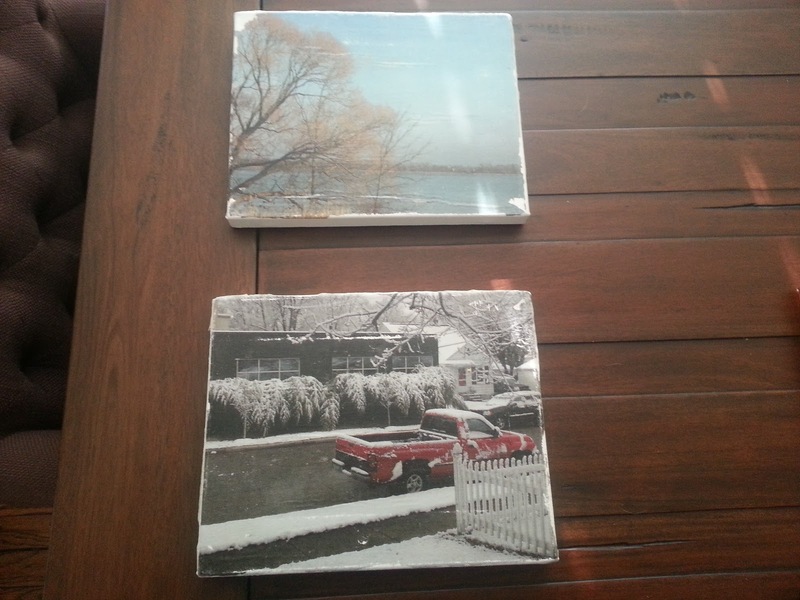 This set of photos are all printed on 5x7" pieces of aluminum flashing, of which I obtained 10 for $2.77 at Home Depot. 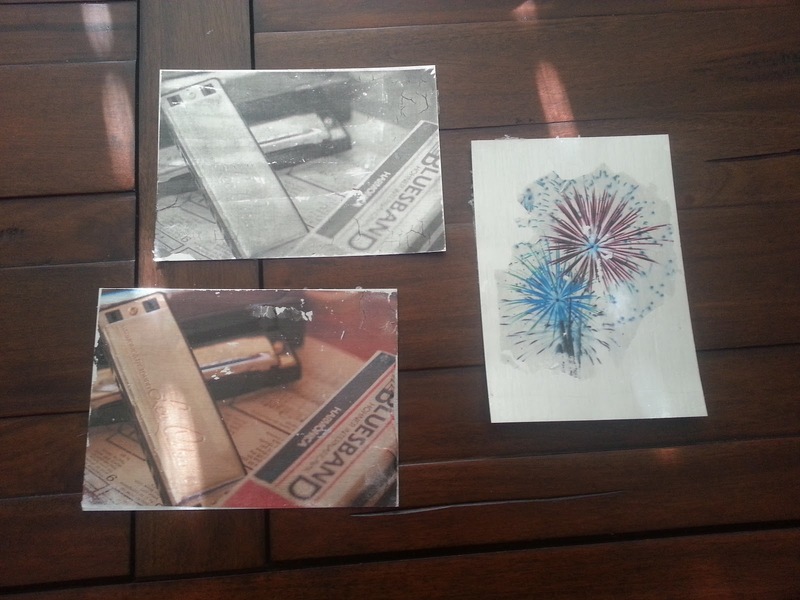 Again, I used the same acrylic gel medium as I did for wood and canvas, but on the fireworks (printed with colors inverted), I cleaned off the blank areas with steel wool to create a distressed look in the original metal, rather than depending on the transferred ink/image to fill in the area. This whole process is enjoyable, and I'm getting to the point where I think I can print on just about anything solid. Oh, the possibilities. My wife and I moved to our new home in Clawson, Michigan just about six months ago, and have loved every bit of this charming community so far. Today I had some time to stroll about the nearby downtown and take a few pictures. Here are some, with a link to the full album in my google+/picasa photos. I spent a little time in Flipside. It's the closest thing I've found to Melodies&Memories that I grew up with in Eastpointe. The southwest corner of downtown -- beautiful building. Frittata - winner of my heart, and a hidden gem award. We have breakfast here once per weekend. This is a brief collection of my Clawson photos, with more available here, and I'm going to keep expanding it both here and by posting to Clawson Patch.